Chris Rennard’s long relationship with the Liberals, and later the Liberal Democrats, began when a compassionate Liberal candidate helped his disabled mother receive her widowed mother allowance. By his 20s Rennard was the most successful election campaigner his party has ever known. He helped the Liberal Party win power in Liverpool in the 1970s and campaigned for Shirley Williams and Roy Jenkins in famous by-elections which helped the Liberal SDP Alliance to compete for power before its acrimonious collapse in the late 80’s. He was then responsible for a series of spectacular by-election victories that rescued his party’s fortunes and he oversaw a huge increase in the party’s number of MPs and elected representatives. Liberal leaders Paddy Ashdown, Charles Kennedy, Menzies Campbell and Nick Clegg would all rely on him as the party grew to the peak of its success. This volume of memoirs spans his first 30 years in politics (to 2006) and includes the highs and lows of his party during the leaderships of Paddy Ashdown (including his hopes for coalition with Tony Blair) and Charles Kennedy, (including the latter’s enforced resignation after revealing publicly his problem with alcohol). There will never be a better inside account of a political party, or contemporary history of the Liberal Democrats. Winning Here is a record that shows how election campaigns are really fought and won and how party leaders change and parties develop. Similarly, there will never be a commentator better placed to tell this story. Required reading for organisers in both the Labour and Conservative Parties … a graphic description of life in the engine room of politics and a timely reminder that the triumph of ideals must be organised. The real beauty of this book is found in the first few chapters detailing Rennard’s childhood in Liverpool. I often skip reading about people’s childhoods in books of this nature, but that would be a great mistake in this case. When the history of the Liberal Democrats comes to be written, Chris will have a central place in it and this book, which already feels like a monument to a forgotten era, will be a valuable source. 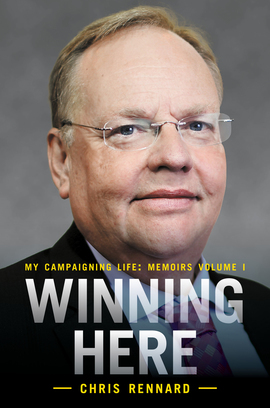 Any Liberal Democrat supporter or activist who wants to better understand the history of the party since its formation in 1988 should read Chris Rennard's first volume of memoirs. Winning Here is far from a dry political manual. It is a compelling and very personal story that chronicles Rennard's life. Certainly this book is generous to colleagues and friends, and suggests he is loyal and considerate in his personal dealings.